Manage your firm's information quickly and easily. Firm Central contains a vast amount of information regarding clients, matters, contacts, and documents. The volume of this information will continue to grow as you expand your business and represent more and more clients. All of this various information can be used to perform an easy and effective conflict check for new and potential clients. 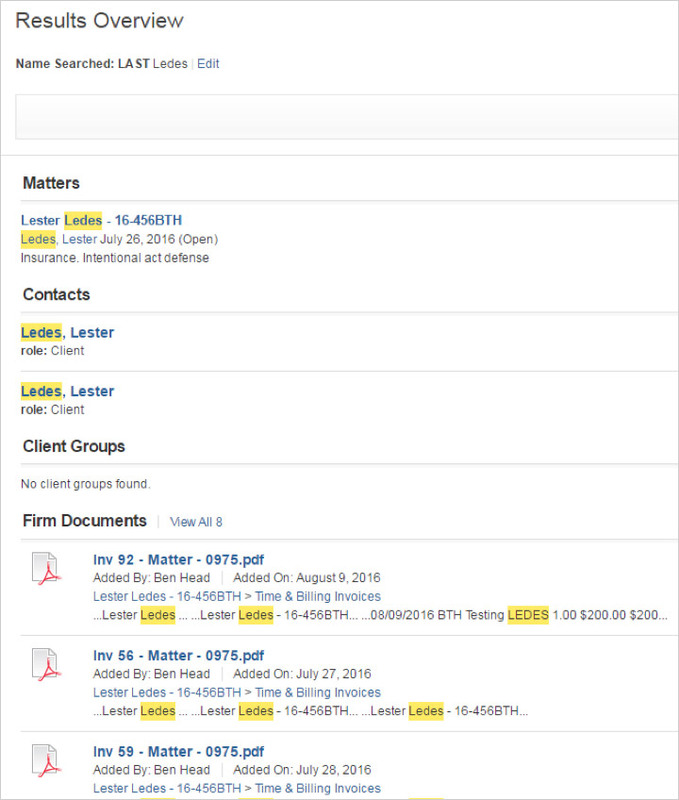 Information relating to clients, matters, and contacts, as well as the content of text-based documents added to Firm Central, becomes searchable through the Conflict Check feature. This allows your firm to quickly mine existing data for potential conflicts. The Conflict Check feature is accessible to Firm Central users with Administrative access. To access your administrator privileges, click on your name in the top right corner of the screen and select Admin. An Admin link will then display in the toolbar at the top of Firm Central. Under the Admin tab, you can click the Conflict Checking link. This will display search fields that will allow you to enter information relating to the potential client. You can search for a person or business, and only need to search for either a last name or a business name. 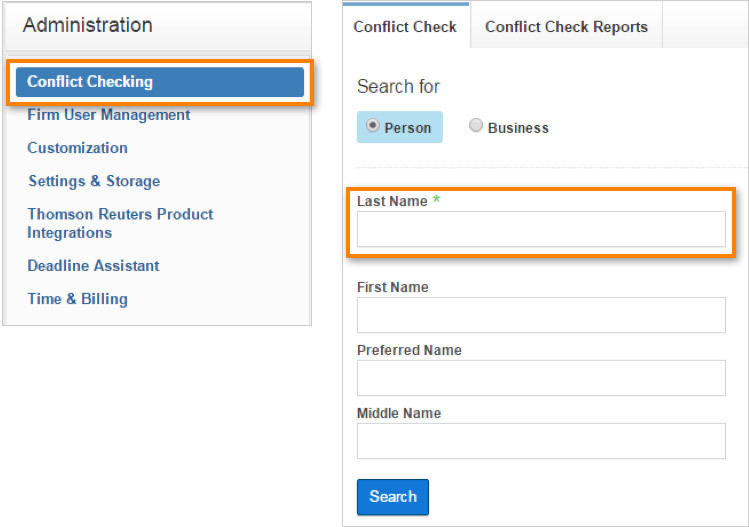 You can enter additional information into the Conflict Check search for a more expansive, detailed conflict check. Running a Conflict Check search will provide you with a list of results, including information from Matters, Clients, Contacts, and Documents. You can click on any of the results to view the full details of the Matter, Client, Contact, or Document. Once you have completed your search, you can click the Create Report button toward the top right corner of the screen. Simply click the View Report link in the pop-up box to download the report in .pdf format and save or print the report for future reference. Even if you do not save the Conflict Check Report, you will be able to access the report via the Conflict Check Reports tab under the Conflict Checking Admin link. A list of your Conflict Check Reports will populate and the list can be sorted in a variety of ways. The Report and the list of Reports will provide you with a clear date and time stamp of when the Conflict Check Report was completed, as well as the Firm Central user that ran the conflict check.